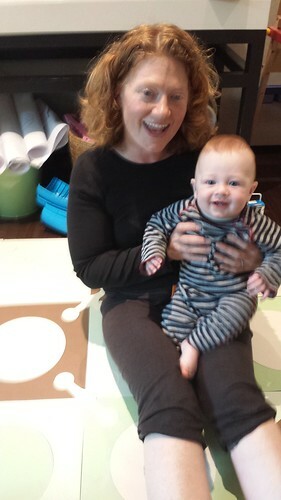 Leo went on his first sleepover this weekend. It was our first night at home without our little boy. It turns out, the sleepover was a bigger occasion for the little girl left at home than it was for Leo. Lucy cried multiple times because she missed Leo. “I want to play with Leo”! I guess mom and dad to yourself just cannot compare. When we went to pick Leo up today, Jovan’s mom was telling us about how it went. 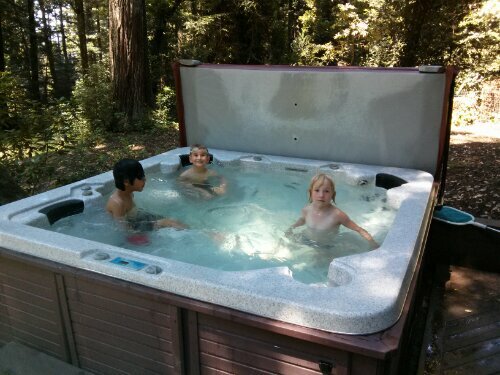 Even though we do not have redwood trees or a hottub at our house we do have some extravagances that others may not. When asked what he usually ate for breakfast, Leo explained to Jovan’s mom, “you probably don’t have it. You can only buy it in whole foods.” “Try me,” say’s Jovan’s mom. “Truffle salt and eggs.” And indeed, they did not have truffle salt for their eggs so Leo settled for chocolate chip waffles. When we came up to join them today, Lucy was happy to get a chance to jump in the hot tub as well. And then when we got home, even though everyone was tired, mommy insisted on doing some Monart. This made Leo take his own turn at crying. 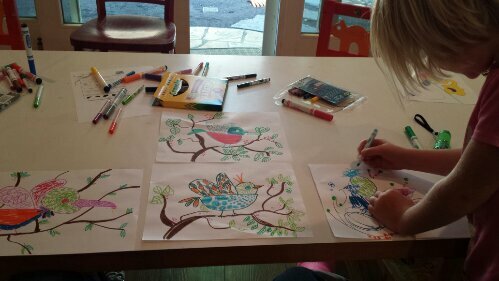 But Lucy happily drew her bird. So mommy has a broken foot. How did this happen? Was it while she was practicing double unders? Was it while she was riding her bike to work with her cool new bike bag? Was it while she was playing in her Sunday basketball game? Or was it, perhaps, while she was walking walking in high heels? Maybe that question was rhetorical. You guess. Now everyone keeps asking me if I am in pain. Well yes, my bum hurts from sitting on it for three days. My armpits hurt from the crutches. My ego hurts from not being able to walk in high heels. 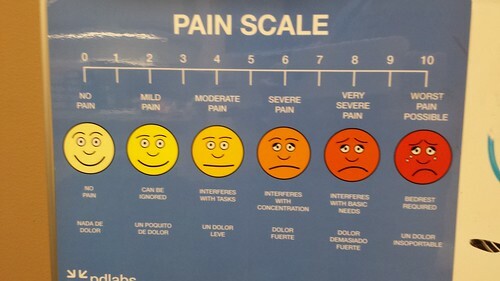 But my foot, well, my foot is probably a 2, mild pain on the pain scale. But enough about my foot. 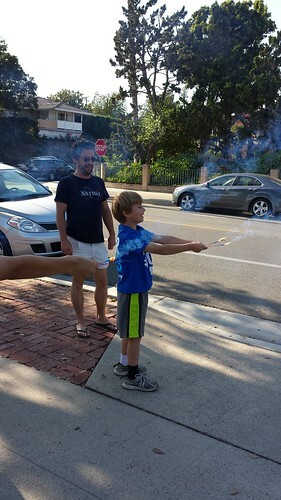 This is the story of our 4th of July trip to Los Angeles. We went to visit Grandpa Ken and the whole Wright clan. 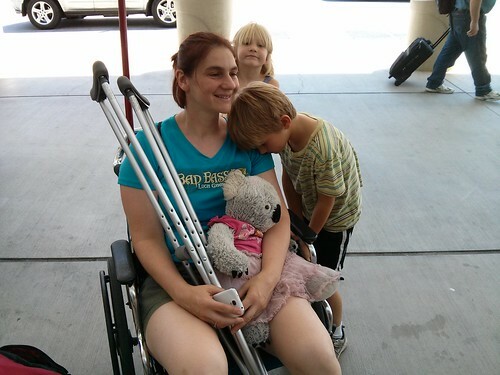 My poor family was travelling with a crippled mommy. Ok, I wont really be able to shut up about the foot. A broken foot has some advantages while travelling. You get to ride a wheelchair in the airport and you get to go the front of the security line. One of the disadvantages, however, of having a broken foot is that you have a heightened sense of danger, especially the kinds of dangers that your children might encounter when you are not able to help them. I don’t think of myself as a helicopter mom, but when you can’t swoop down on your children and pull them from harm, all of a sudden the world seems all that much more dangerous. And this has made me really good at asking Caleb to take better care of my children. 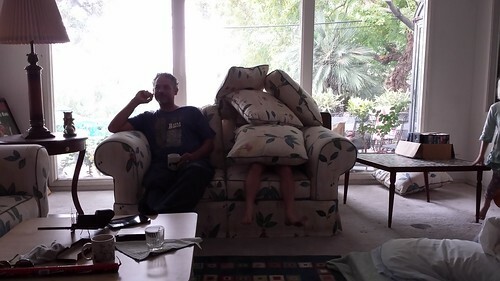 Caleb tolerated this, as well as all of the taking care of me, pretty well. Now I was not just a nervous Nellie on this trip for no reason. Grandpa Ken’s house on the fourth of July actually is a bit of a warzone. 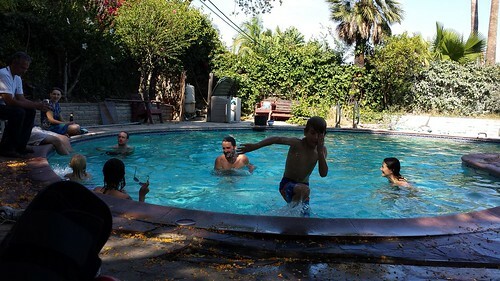 Our first deathtrap, of course, had cannonballs going off left and right …..
Then when everyone got out of the pool our next activity was lighting off fireworks. Why do you seem so nervous? Lisa wanted to know. Well have you looked at yourself recently Lisa? 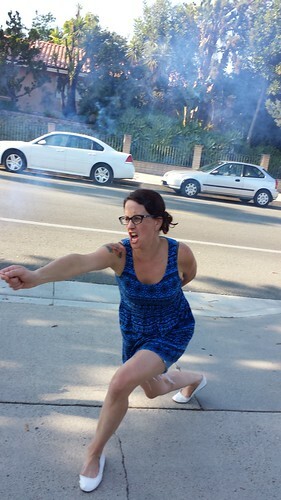 Try to be a little calmer with those sparklers. Fullerton was crazy with at home fireworks. I think our family party was actually relatively tame. I have a feeling that the fireworks laws have become more relaxed. Because there were just tons of fireworks going off in every yard. I don’t remember ever seeing this many. Our trip was not without wholesome fun as well. Great grandma Alberta brought some stickers. I was a little worried that Leo might be getting to old for stickers, but then again, Alberta is not too old for stickers, and she’s 85, so I guess he still has some time to go. Crystal made a red white and blue cake. When I heard, red, white and blue cake, I was expecting something with some food coloring and frosting, but check this out, au natural. Those are strawberries and blueberries if you can’t see. Crystal and Paul are expecting a baby in December so we were happy to let them have time to get used to kids in advance. 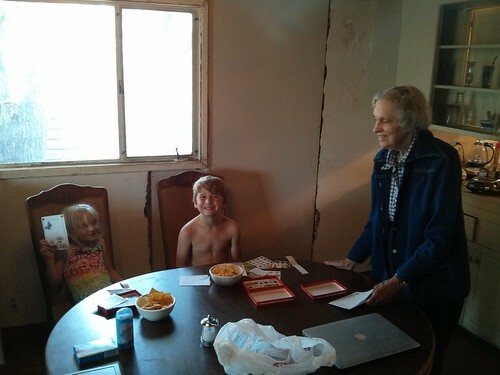 Here is Paul hanging out with the kids. Lucy has helped Leo to hide. You will never guess where Leo’s secret hideout is. There were actually three Lucys attending our 4th of July party, our daughter, Crystal’s dog, and Lisa’s boyfriend, Pat’s, dog. So that’s right, only one of the Lucys was a person. We are hoping that our Lucy will not grow up and be mad at us for giving her a dog’s name. I have heard that naming a children these days is stressful because everyone wants to have the most unique names for their child. Just when you think that you found the sweetest, most dignified, perfect name for a future world leader, it turns out that everyone else is named Ella too. What I have not heard of yet, is the problem that Caleb and I are suffering from. We found the sweetest, most dignified, perfect name for a world leader, and everybody else’s *dog* is named Lucy too. But back to the story. In the middle of all this fun we had some bad Lucy news. Pat’s dog Lucy had escaped from the yard. So many loud booms had made her run out of the yard scared. So Pat went off to find the dog. He looked high and low. She had not returned by morning. He put up signs. Still no dog. And here is the silver lining in this story. Grandpa Ken was really impressed. If a man could care this much for a dog, he must have a lot of potential to care for his girlfriend as well. The sure sign of a good guy. And when Pat had impressed Ken just enough … Lucy came home. To commemorate this event, our Lucy drew a picture. Here is Pat with his dog, oh and with fireball hands as well (artistic embellishment). With the dog safe, and the party disbanded, we decided to journey from the OC out to Los Angeles itself. We went to visit Caitlin. She has a new baby, Erik the Red. 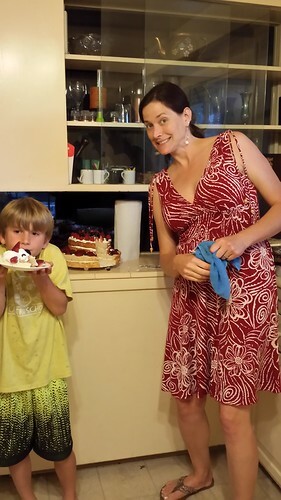 Given his parents and his sister had red hair Caitlin felt pretty confident that there was only a 25% chance that her baby turn out blonde, so she knew that Erik the red was a safe name. Caitlin had the more common baby naming predicament with her first child, who she named Ella, but so far she has not expressed any concern for Ella’s future. It was really fun to see Ella all grown up. We had not seen her since she was a little baby. And now at 4, she is even a little babysitter. She swooped Lucy away and they played happily setting up traps, traps for god knows what, in the back yard, while the parents talked. And little baby Erik smiled contentedly. But like all good things, our vacation had to come to an end. 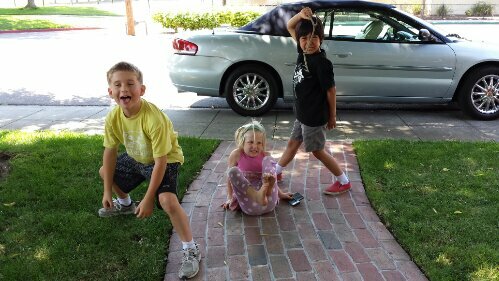 And since I didn’t take any pictures of Grandpa Ken, I asked the kids to pose. 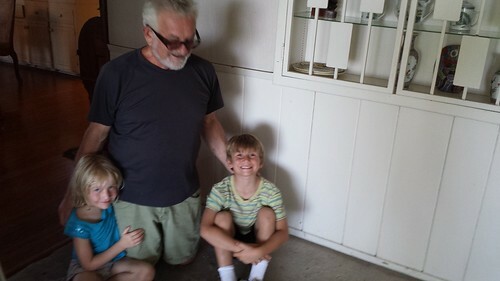 Leo has been doing this thing recently when he meets someone new, he starts jumping around in a squatting position saying, “it’s mini me!” Apparently, taking a picture with Grandpa brings out mini-me as well. Aw, cute. Thanks everyone for such a great independence day. As Lucy the girl says. It was AWESOME.